How do CPA requirements differ by state? Which states are best for international candidates? How are CPA requirements determined by states? Is an ethics exam required? Does the state issue CPA certificates? Which state has the easiest education requirements? What are some ways to meet the 150-hour education requirement? Is the state a NASBA state? Can I practice in different states? What if I move? To become a CPA, you must meet the requirements of the state where you will practice. Every state requires the CPA Exam, and most require 150 semester hours plus two years of experience. Some states require an ethics exam. Learn how to become a CPA here today. Each of the 55 U.S. jurisdictions (the 50 U.S. states plus DC, Guam, Puerto Rico, the Virgin Islands, and the Mariana Islands) maintains its own CPA requirements. When you decide to become a CPA, you must decide which jurisdiction you wish to become licensed in. You will apply for the CPA Exam and your CPA license in that state. You will need to abide by the CPA requirements of your jurisdiction to remain licensed. Select your jurisdiction below to learn how to meet the requirements for the CPA Exam, become licensed, and maintain your license as a certified public accountant. Below we will discuss some of these in further detail. Preparing for the CPA Exam? See why Gleim is your first choice when you’re serious about passing the CPA Exam. Before you can become licensed as a certified public accountant, you must pass all four parts of the Uniform CPA Examination: Auditing (AUD), Business Environment and Concepts (BEC), Financial Accounting and Reporting (FAR), and Regulation (REG). This is a grueling process that can take a year or more. Every state requires you complete either 120 or 150 credit-hours at an accredited college or university before you can apply to take the CPA Exam. Usually a minimum of 24 hours of your coursework needs to be in accounting, but some states require you also complete a number of hours in general business subjects like finance, business law, or management. Some states require a bachelor’s degree in accounting or other business-related fields like finance, while others are fine with a general bachelor’s degree. A few states will allow you to sit for the CPA Exam before you graduate. You will need to contact your state board of accountancy to confirm that your academic credits qualify. As part of the CPA Exam application process, you will have to submit your transcripts. Some states may require proof of U.S. citizenship, a Social Security number, or residency when you apply for the CPA Exam. Many states also require that you be at least 18 years old before you take the CPA Exam. Which states are best for international CPA candidates? If you are applying for the CPA Exam and license from outside the U.S., you will likely need to select a state whose CPA requirements do not include citizenship, residency, or a Social Security number. In addition, you’ll need to make sure your chosen state participates in the international administration of the CPA Exam, as some do not. See our recommended states for international CPAs. A bachelor’s degree in accounting used to satisfy the education requirement for a CPA license when most states only required 120 hours of coursework. Now the prerequisite is nearly unanimously 150 semester hours across all 55 jurisdictions. States that require only 120 hours to take the CPA Exam will require you to complete 150 credit-hours in total before you can apply for a license (these are called two-tier states). Only two jurisdictions still grant licenses to CPA candidates with fewer than 150 education hours. See which state has the easiest education requirements below. Experience requirements differ, but the majority of state boards expect you to collect at least two years of experience in public accounting before they will grant you a CPA license. Some state boards accept accounting experience in areas of industry or government, but they generally require a longer period. In most cases, an active, licensed CPA will need to verify your work experience. Some state boards may require him or her to be your supervisor. Most states also require you take a specific exam to demonstrate your understanding of ethics as a certified public accountant. While some state boards administer their own ethics exam, many use the Professional Ethics Exam administered by the AICPA. In addition, when you renew your license, you will need to have completed the CPE courses as specified by your state. Be sure to check with the state board where you will be reporting your CPE for specific requirements. You can find more information on the state pages linked above. Gleim is a registered sponsor of self-study continuing professional education for CPAs! The requirements to become a CPA are set forth in state law. Each jurisdiction has a board of accountancy that is in charge of modifying and enforcing the law and rules. These state boards are created in state statute to assist state governments in the licensing and regulation of the public accounting profession. Two national associations feature prominently in the CPA profession, but they do not govern the requirements. The National Association of State Boards (NASBA) is a forum for regulators and practitioners to address issues relevant to the accounting profession. The American Institute of Certified Public Accountants (AICPA) sets ethical standards for the profession and U.S. auditing standards; it also develops the CPA Exam. In order to practice public accounting, you must be licensed in the state where you practice. For most, it makes sense to become licensed in the state in which you live and work. If you are following the traditional CPA career path, the CPA requirements do not vary so much that they warrant selecting a different jurisdiction. However, international candidates and others in non-traditional CPA roles must also select a state for their CPA license, even if they never intend to practice public accounting in the U.S. If you have the option to choose a state for your CPA Exam and license, take a look at the following factors as you make your decision. The state board you choose will issue your license. You must be licensed in the state in which you wish to practice. When you are determining where to register to take the CPA Exam, first consider where you want to practice. If you decide to register for the exam in a state other than the one you want to practice in, check to see if you will be eligible to transfer scores between the two states and if you have met the state’s requirements for licensure. Some state boards allow candidates to apply via CPA Central, one of NASBA’s CPA Examination Services (CPAES). With other state boards, you can apply on their website or by calling to request an application be mailed to you. As many state boards have age, citizenship, residency, Social Security, experience, and educational requirements, they expect you to provide documentation proving that you meet these requirements. Along with the CPA Exam requirement, most state boards also have an ethics exam requirement, as we mentioned above. While it’s nowhere as difficult as the four sections of the CPA Exam, you will still need to prepare. Some states may even allow it to count as a CPE credit and most will require you pass it within two years of passing the CPA Exam. Though most states are moving away from issuing a certificate upon completion of the CPA Exam, a few states still do. These are called “two-tier” states. If you receive a CPA certificate, you may use the credential CPA after your name, but you may not practice public accounting. Typically you must include “Not in public practice” after CPA. You can choose to go on to receive your CPA license by completing the remaining requirements. 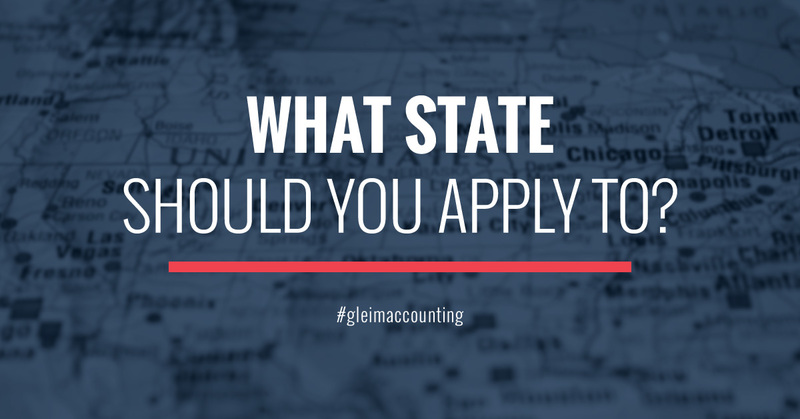 Most states are one-tier, which means they do not offer a certificate but rather require you complete all requirements before they will recognize you as a CPA in any capacity. 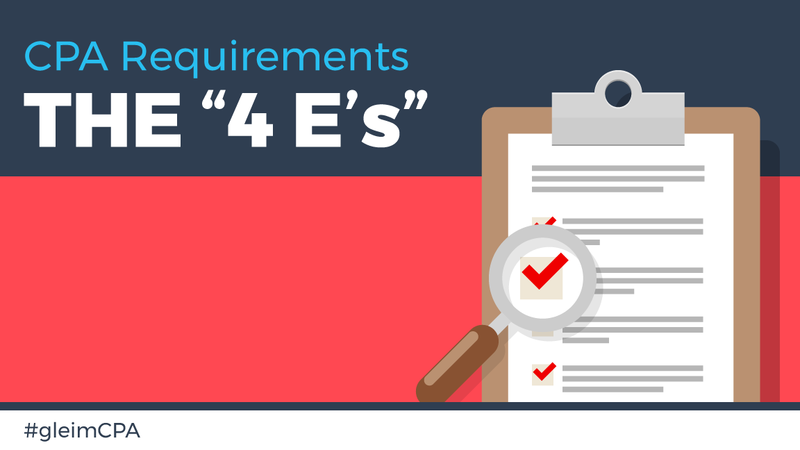 You must fulfill CPE requirements if you want to maintain your license to practice as a CPA. These can vary from state to state in terms of the number of hours and the makeup of the courses required. You may also find some states specify the hours required for certain topics depending on your field of practice. Most will allow you to use self-study CPE courses available online. Experience requirements differ, but the majority of state boards expect you to collect at least two years of experience in public accounting before receiving the CPA license. Some state boards accept accounting experience in areas of industry or government, but they generally require a longer period. You will want to confirm the experience requirements for the states you are considering. As we mentioned, you will need 150 credit-hours at an accredited school before you can become licensed as a CPA—except in two states. You will need to make sure your education will be accepted by the state board of accountancy, because the details can vary by state. The Virgin Islands require residency. You must be there 30 days before applying to sit for the CPA Exam. Guam does NOT require you to be a resident or travel there for the exam, so it may be a good choice to consider if you are looking for a state with easier education requirements. With almost every state requiring 150 college-level credit-hours for licensure as a CPA, candidates with only a bachelor’s degree (120 credit-hours) have to figure out how to bridge that 30-hour gap. 1. Take more classes, at the graduate or undergraduate level. You don’t have to earn a second degree—you only need 30 more hours. 3. See if your school offers a for-credit internship or CPA-review course. These are rare but if available can help you earn credit and study toward the CPA Exam at the same time. The state boards determine an initial application fee. While NASBA has established the fee schedule for each section of the CPA Exam, the state boards can increase or decrease NASBA’s suggestions as desired. The state boards can also charge a registration fee for a candidate’s Notice to Schedule (NTS). If a state board includes an ethics exam in its licensure requirements, then you will also face a fee for taking that. Finally, the state boards also assign a price to the CPA license itself, which can cost anywhere between $50-$300. NASBA offers CPA Examination Services (CPAES) to the state boards of accountancy, and several of the state boards have taken NABSA up on this offer. Through CPAES, NASBA handles tasks such as application processing, credential evaluation, score reporting, and more for the state boards. This will determine whether you work with NASBA or the state board itself for much of the CPA Exam process. Most CPAs can practice across different states thanks to CPA mobility. According to the AICPA, the CPA Mobility provision specifically allows for no-notification interstate practice by CPAs whose “home jurisdiction or who individually are substantially equivalent where they meet the UAA licensure standard.” You automatically consent to the requirements of the state board of accountancy’s jurisdiction wherever you practice. Most state laws require you to declare a principal place of business and hold a valid license in that state to practice. So if you move, you will need to apply for a reciprocal CPA license for your new home state. Our Personal Counselors and international support team are here to help Gleim CPA candidates all the way. Reach out to our team here.